President Vladimir Putin meeting in March 2017 with President of Iceland Guðni Jóhannesson at the International Arctic Forum in Arkhangelsk, Russia. Photo via kremlin.ru. Russia’s relations with the West are the worst they have been since the end of the Cold War — more than a quarter century — though they are better in the Arctic region. First, there was Russia’s annexation of Crimea in February 2014, which the United Nations General Assembly condemned as a violation of international law, including the 1994 Budapest Memorandum on Security Assurances. Western countries responded with waves of sanctions that damaged Russian banking and its energy industry. Now, there is an ongoing investigation into the extent of Russian interference in the United States 2016 elections, which at the least included hacking into Democratic National Committee computers and planting fake news stories on social media. On top of that, Russia meddled in France’s 2017 presidential election, among others. Outside of the Arctic, Russia is no friend of international harmony. The rationale for Russia’s actions is unclear. President Vladimir Putin claims the annexation of Crimea was in response to the will of the Crimean people, following a referendum on March 16, 2014 (although the veracity of the results is questionable). Russia’s aggression could be a nationalist re-assertion of its power or a strategic gamble to maintain access to the militarily important Black Sea. Perhaps all this posturing has been to shore up domestic support, as independent polling shows that Putin’s popularity in Russia increased after the Crimea incident, to 80 per cent. Russian election interference could be a means to help candidates more hospitable to Russia’s interests. Russia’s bad behaviour does not necessairily carry over to the Arctic region. Its government continues to invest in defence, forming a “military group” with 6,000 troops in the northern Murmansk region and opening a new military base on Wrangel Island. Yet, Russia also has pursued co-operation in the region, such as bilateral talks to resolve territorial disputes over its extended continental shelf; further, it has complied perfectly with the voluntary United Nations Convention on the Law of the Sea. Its government representatives have at least paid lip service to the importance of co-operation on environmental issues and climate change. What does Russia’s Arctic behaviour teach us about its politics overall? Here are three lessons to think about. They are subject to update, as revelations about Russia and the administration of President Donald Trump appear almost daily. Russia must maintain a relationship with the West, as it represents a key market for its Arctic oil; Western governments should thus continue to engage with the Kremlin. Russia is still the world’s largest oil producer. Arctic Siberia contains the majority of Russia’s 80 billion barrels of discovered oil, or nearly two-thirds of its total production. Revenues from oil and natural gas make up 43 per cent of Russia’s federal government budget. It has the world’s only offshore oil rig in the Arctic Ocean, which is expected to produce more than 125,000 barrels a day by next year. Some have reported that Russia is focusing more on Chinese markets for the future. Yet, 60 per cent of Russia’s oil and 75 per cent of its natural gas are exported to Europe. It is still possible to co-operate with Russia, as it needs European markets for its energy exports. In September 2014, Exxon and Rosneft – a Russian oil company – discovered 700 million barrels of oil in the Kara Sea, bordering the Arctic Ocean, a project from which Exxon ultimately withdrew due to sanctions. Rosneft said that it planned to exploit the field without Exxon, but so far has not been able to do so. By the end of 2015, Exxon estimated it had lost $1 billion due to sanctions on its Russian investments. An as-of-yet unproven hypothesis is that Russia interfered in the United States’ election in the hope that the Trump Administration would lift sanctions against the oil industry. Trump appointed former Exxon CEO (during time of the Kara discovery) Rex Tillerson as the Secretary of State. If that was Putin’s plan, clearly it has backfired, in fact worsening relations with the United States and possibly inviting yet another round of sanctions. If the gambit had worked, it would have helped the Russian economy; even now, perhaps it will inflate Putin’s popularity, as was the case after the Crimean episode. Despite difficulties, it is worthwhile to work to maintain diplomatic relations with Russia. This incentive for co-operation has affected Arctic politics. 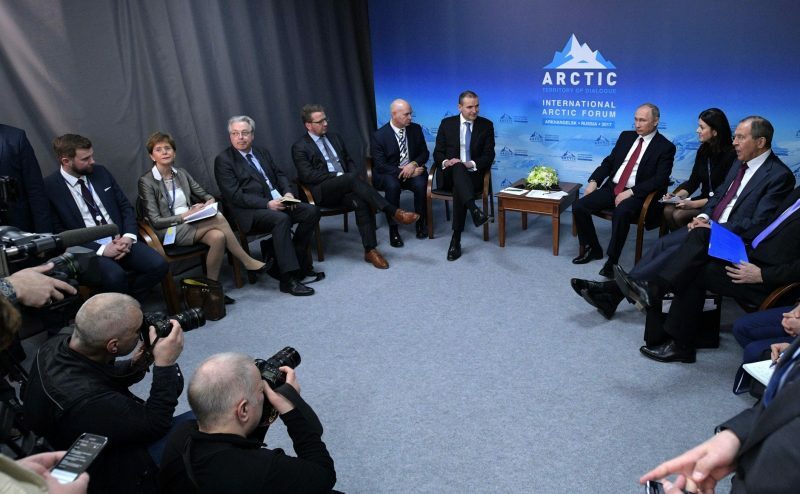 Russia continues to co-operate in the Arctic Council. As I have written elsewhere, the number of comments that Russian delegates make in the Council is comparable to other member countries, as are its delegation sizes and project sponsorships. In fact, the number of projects that it sponsors in the Council continues to increase. Russia’s Foreign Minister, Sergey Lavrov, used the recent Arctic Council meeting in Fairbanks, Alaska, as a chance to visit President Trump and Tillerson at the White House (which has created no end of controversy for the Trump Administration). The Russian government currently sponsors or co-sponsors 19 Arctic Council projects, such as work to collect methane emissions, reduce emissions from fish processing facilities, enhance Arctic search and rescue and provide climate change adaptation for nomadic herders. This represents about one-fifth of its output. The negative relations with the United States have not really spilled into the Council; Russian officials complete work to protect the Arctic environment and respond to climate change. It is possible to co-operate with Russia, even on issues such as climate change, because of its need to maintain its energy industry. It is easy to think of the Russian government as a monolithic oligarchy, with Vladimir Putin as its head. Yet, strong parts of the Russian environmental bureaucracy have long supported democratizing the country, often at odds with Russia’s central government. Russia is home to independent researchers, such as those at the internationally well-regarded National Research University Higher School of Economics. Indigenous peoples in the Russian Arctic support environmental protection, but have to walk a difficult line as they face pressure from the Kremlin to support central government policies. The Russian government is more than Putin. Russia’s international behaviour is often erratic and threatens international security. Yet, its Arctic record teaches use some lessons. It relies on its Arctic energy industry to fuel its economy, including extensive exports to the West; thus, Russian leaders have an incentive to co-operate with the West. It continues to co-operate in the Arctic Council and sponsors environmental projects regularly; thus, it has not adopted a hostile posture in every aspect of its foreign policy. Russia includes scientists, environmentalists and Indigenous peoples who care about the environment and want to have peaceful relations with the West; thus, the leadership picture in the country is more diverse than it seems. Russia behaves badly, but Arctic politics shows us there is a way forward to work multilaterally with Russia. United Nations General Assembly, Resolution Adopted by the General Assembly on 27 March 2014, 68/262, Territorial Integrity of Ukraine. Available: http://www.un.org/en/ga/search/view_doc.asp?symbol=A/RES/68/262. Reed Smith, “Worldwide: Overview of the U.S. and EU Sanctions On Russia,” Mondaq, October 6, 2014, http://www.mondaq.com/unitedstates/x/344530/Export+controls+Trade+Investment+Sanctions/Overview+Of+The+US+And+EU+Sanctions+On+Russia. Amanda Becker, “Russia Election Hacking: Everything We Know About U.S. Investigations into Alleged Interference,” Independent, May 18, 2017, http://www.independent.co.uk/news/world/americas/russia-election-hacking-us-investigations-everything-we-know-interference-donald-trump-hillary-a7742426.html. Andy Greenberg, “The NSA Confirms It: Russia Hacked French Election ‘Infrastructure,’ ” Wired, May 8, 2017, https://www.wired.com/2017/05/nsa-director-confirms-russia-hacked-french-election-infrastructure/. Adam Withnall, “Vladimir Putin Says He Only Ordered The Annexation of Crimea to Russia Because an ‘Unofficial Survey’ Told Him To Do So.” The Independent, March 10, 2015, http://www.independent.co.uk/news/world/europe/vladimir-putin-says-he-only-ordered-the-annexation-of-crimea-to-russia-because-an-unofficial-survey-10098854.html. Michael B. Kelley, “Putin’s Own Human Rights Council Published a Report Slamming The ‘Discredited’ Crimea Referendum,” Business Insider, May 6, 2014, http://www.businessinsider.com/did-vladimir-putins-human-rights-council-just-publish-2014-5; Kennetz Rapoza, “One Year After Russia Annexed Crimea, Locals Prefer Moscow to Kiev,” Forbes, March 20, 2015, https://www.forbes.com/sites/kenrapoza/2015/03/20/one-year-after-russia-annexed-crimea-locals-prefer-moscow-to-kiev/#150a802f510d; Andrea Chalupa, “One Year Later In Crimea: Polls Don’t Tell The Whole Story,” Forbes, March 30, 2015, https://www.forbes.com/sites/realspin/2015/03/30/one-year-later-in-crimea-polls-dont-tell-the-whole-story/#31ea0c605b24. Paul N. Schwartz, “Crimea’s Strategic Value to Russia,” Center for Strategic and International Studies, March 18, 2014, https://www.csis.org/blogs/post-soviet-post/crimeas-strategic-value-russia. Jaroslaw Cwiek-Karpowicz, Sanctions and Russia (Warsaw: Polish Institute of International Affairs, 2015), 63. Available: https://www.pism.pl/files/?id_plik=19045. Isabelle Mandraud, “Russia Prepares for Ice-Cold War with Show of Military Force in the Arctic,” The Guardian, October 21, 2014, http://www.theguardian.com/world/2014/oct/21/russia-arctic-military-oil-gas-putin. The Moscow Times, “Russia’s First Arctic Base Opens For Business,” October 22, 2014, http://www.themoscowtimes.com/business/article/russia-s-first-arctic-base-opens-for-business/509913.html. For example, see Richard Milne, “Denmark Rejects Russia Call for Swift Talks on Arctic Rights,” Financial Times, September 12, 2016, http://www.ft.com/cms/s/0/d1810bd4-77e5-11e6-97ae-647294649b28.html#axzz4K4fS2Ahf. For example, see Sputnik News, “Russia Sees No Obstacles for EU-Arctic Council Co-operation in Science, Research,” October 6, 2016, https://sputniknews.com/politics/20161006/1046057245/russia-arctic-eu-cooperation.html. United States Energy Information Administration, Country Analysis Brief: Russia (Washington, D.C.: United States Energy Information Administration, 2014), 4. Available: https://www.eia.gov/beta/international/analysis_includes/countries_long/Russia/russia.pdf. Lucy Hornby and Jamal Anderlini, “China and Russia Sign $400 Billion Gas Deal,” Financial Times, March 21, 2014, http://www.ft.com/intl/cms/s/0/d9a8b800-e09a-11e3-9534-00144feabdc0.html#axzz3PHsJZCWZ. United States Energy Information Administration, Country Analysis Brief: Russia , 1. Thomas Nilsen, “Discovers Kara Sea Oil A Week Before Sanctions Hit,” Barents Observer, September 29, 2014, http://barentsobserver.com/en/energy/2014/09/discovers-kara-sea-oil-week-sanctions-hit-29-09. Thomas Nilsen, “Gazprom to Resume Kara Sea Drilling,” Barents Observer, February 7, 2017, https://thebarentsobserver.com/en/industry-and-energy/2017/02/gazprom-resume-kara-sea-drilling. Tom DiChristopher, “Exxon Mobil Could Tap Huge Arctic Assets if U.S.-Russian Relations Thaw,” CNBC, December 13, 2016, http://www.cnbc.com/2016/12/13/exxon-mobil-could-tap-huge-arctic-assets-if-us-russian-relations-thaw.html. Andrew Chater, “Explaining Russia’s Relationship with the Arctic Council,” International Organization Research Journal 11, no. 4 (2016): 41-54. For more information, see: https://www.timeshighereducation.com/world-university-rankings/higher-school-economics#ranking-dataset/600172. John Thompson, “The Delicate Subject in Northern Russia of Indigenous Rights,” Arctic Deeply, April 11, 2017, https://www.newsdeeply.com/arctic/articles/2017/04/11/the-delicate-subject-in-northern-russia-of-indigenous-rights-2.